It's very easy to do! Here's how you can do it if you'd like. 2. Click on "Settings" in the middle of the page. 3. Click on "Email & Mobile" which is listed in all the tabs going across the top of the page. 4. Under "Mobile Template", click on " Yes, On mobile devices, show the mobile version of my template." 5. Click "Save Settings" and you're done! You're blog should now appear much quicker and easier to navigate when viewed on a phone. Thanks for the tip! I'm going to do it right now. and thanks for the tip! I did notice how easy it ws to read your blog when i read it on my phone. 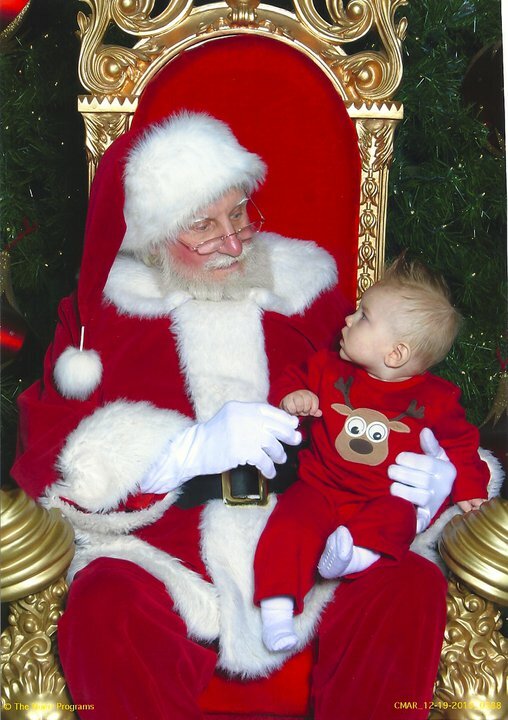 ok, the picture of santa and E looking at each other is way too cute!! love it! thanks for the tip hun! I just enabled mine! woot! Manny is so cute. Love his outfit! What size is he wearing now? If you want and if the seasons work out, I can send you C's monkey outfit that he wore in his Christmas pictures. They are 12-18 months... I could send them once winter is over. It is the Old Navy sock monkey line. C did the same for his pictures. He has seen Santa twice. The first time he just stared at him, and the second he stared and actually tried to pull at his beard. ha. what a cute picture with Santa. That is what mine was like last year with Emma... This year I am in it:) She was not a fan this year! Great idea! I've just my blog mobile-friendly. Thanks! Oh my gosh he is too cute! Merry Christmas to you and your family!! Ok so Manny's outfit on Santa's lap is perfect. A reindeer?? What could be better?? Second of all, your house is ridiculous. 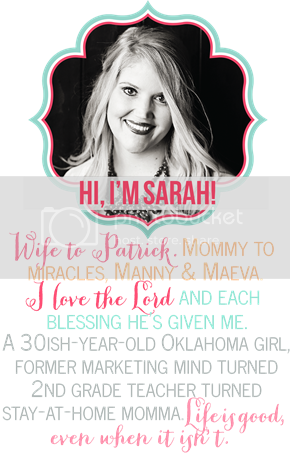 SARAH! How do you have time for all of that???? You decorated every nook and cranny of your house!! Ugh, I wish I was better at that, cause your house looks amazing. I can see why they wanted you to do the parade of homes, you are TALENTED!!! I miss you so much! Got the Christmas card today and I LOVE IT. Oh and I got all the CD's and the precious shoes, thank you so much!! I can't wait to try them on Nathan. You are the best, and I miss you so much! Can't wait to see you again soon! Let's catch up soon! Manny's Santa picture is precious. Just wanted to tell you that I have enjoyed your blog this year, and never commented, but did want to take time to tell you "thank you" for the many articles of inspiration on decorating, cooking and life in your blog. Merry Christmas and a Blessed New Year. why dont i have the "mobile template" in my settings? Under "Mobile Template", click on "Yes, On mobile devices, show the mobile version of my template." in my settings...? I only see "Mobile Devices" where I can put in my phone number and be able to text or send a picture to be directly posted to my blog. Is there some kind of blogger update I need to download? Any help would be much appreciated! Thanks! !